The party was on at True Fitness! It was an exhilarating night as True Fitness Suntec transformed into a dance club for Dance Fiesta. A 3-hour dance workout of ultra-fun routines, we brought back all the favourite moves and club hits from SH’BAM™ and BODYJAM® - two well loved Les Mills™ International dance classes offered at all True Fitness centres. International Trainers from Les Mills™ Asia Pacific - Gandalf Archer, Michelle Dean and Fetty Fatimah – were in town exclusively at True Fitness, to lead the unforgettable dance rave. They hit the stage, bringing infectious energy together with over 150 participants who packed themselves onto the dance floor, and worked their best moves together! Look out for the next Dance Fiesta in 2013! Following the success of past years’ Mega Combat, True Fitness’s annual signature event proved once again to be a hit among True Fitness members, as well as members of the public! 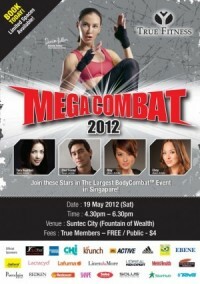 Held at Suntec City’s Fountain of Wealth, over 600 participants kicked and punched along with True Fitness instructors; making this Singapore’s largest outdoor BodyCombatTM event to date. The buzz of activities started as early as 1.15pm, where participants started lining up to check-in for the event, as well as to collect their Mega Combat 2012 event T-shirt. Come 4pm, saw a huge crowd starting to gather outside the Fountain of Wealth entrance, eager looking faces getting all hyped up and ready for a fantastic workout which was scheduled to commence at 4.30pm. True Fitness opened the doors to its seventh outlet in Tampines, Singapore’s largest residential area, at the start of year 2012. Located on Level 8 at NTUC Income Tampines Junction, True Group members and the public were invited to have a firsthand experience of its facilities in a special opening event on 17 January 2012. Investing over $3.5 million, this new centre spans over a massive 24,000 square feet of gym space with over 100 state-of-the-art cardiovascular training equipment, a comprehensive array of strength and resistance training equipment, a Powerplate® workout area, one dedicated Hot Yoga studio, a Group Exercise studio and Spinning studio. It also houses a Muay Thai Kickboxing Ring, a first among True Fitness gyms in Singapore. “We believe in adding variety to an exercise regime in order to keep things interesting, and we are always on a lookout for innovative equipment to achieve this objective. Examples of such are Kick Boxing held in our Muay Thai Rings, Power Plate®, 1-Vest Training, TRX® Suspension Training® and Agility Circuit Training.” Says Mr. Patrick Wee, founder and CEO of the True Group.